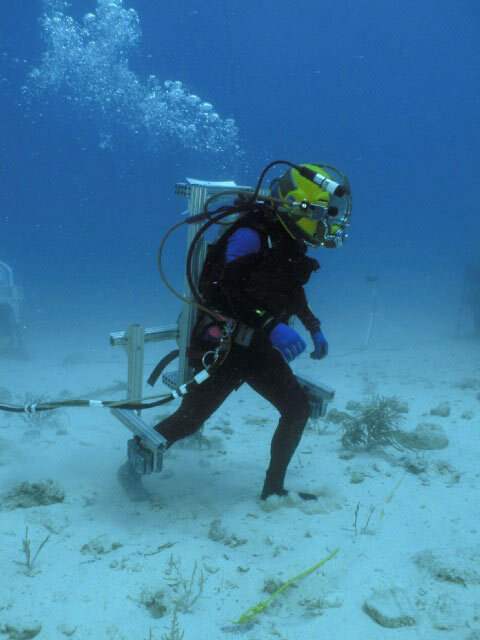 For decades now I have been a strong proponent for using the undersea environment as an analog – or model - for space exploration. The idea of analogs is not new nor it is limited to space-ocean subsets. For example, the Antarctic and the Desert are being used right now for both Mars and Lunar exploration models. In fact, one of my books, ABYSS OF ELYSIUM was left by a long time friend and fellow explorer, Peter Kokh in the desert base of the Mars Society for the reading enjoyment of subsequent crews there. NASA Astronauts are now using the ocean-analog for all kinds of purposes, much like the undersea station I designed, the Carpenter Space Analog Station was used in 1997-98 on a series of unsersea missions only 15 scant miles from the current expeditions. The picture here shows a NASA astronaut using the undersea environment to mimic lunar gravitational conditions. This idea is quite alive and well and viable as evidenced by Lloyd Godson’s Australian project currently in work called BioSub, testing out some unique bioregenerative life support ideas in his underwater space analog station. The idea is not only sound in using the undersea environment as a space analog, but using the undersea environment as a permanent human dwelling place as well. It will happen, of course, eventually. Someone will wake u and build a permanent undersea community – and I’ll just bet it will be the League of the New Worlds. Check it out!